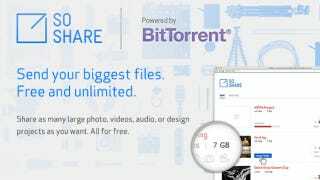 Not too long ago, BitTorrent launched a little project called Sync, which provides practically unlimited "cloud" storage. Now the professional sharers are rolling out yet another service called "SoShare" which promises to let you easily send huge files to friends and coworkers with little to no hassle. Up to a whole terabyte at the click of a button. Like Sync, SoShare pulls its power from that BitTorrent technology we all know and love, and spins it out into yet another application. With SoShare, you simply upload the files you want to send using the service's web-client, and then specify the email addresses of the folks you'd like to send it too. Then, presto, the recipients get a link in their email and can start downloading right away, without setting up an account of their own. All they need is the SoShare plugin. And if you really want to share the love, you can get a public download link and put it anywhere you want. Because we're talking about BitTorrent protocol here, this delivery comes with all the bonuses you might expect; you can pause your mammoth download and pick it up again later, or leave the site and let the uploading/downloading go in the background. Essentially it's just a SUPER BEEFY version of email attachments, but without the size limits. Or at least without any size limits you're likely to sidle up to. The only real catch is that the files aren't available forever; they expire after 30 days. As such, this is not torrent replacement, but then again it's not aiming to be. Instead, it's designed with professionals in mind, professionals who have huge files to shunt around.